General Mills' iconic breakfast flake started cross-promoting with baseball in 1927 and continues to the present day. In the 1930s, their increasingly sophisticated ads expanded to outfield walls, radio shows, TV broadcasts, and lots of players on cereal boxes. The 1939 All-Star game rosters featured an absurd 46 Wheaties player-spokesmen. While not sets in the traditional sense, General Mills printed rolling groups of pro endorsements, many with playing tips, on 1930s and 40s Wheaties box panels. They created no less than 17 different series in all! 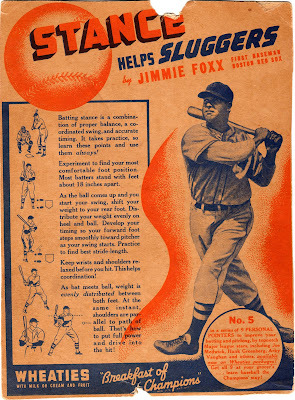 1939's "Series 12" placed Jimmie Foxx (the reigning AL MVP) at #5 and its text helped kids with their batting stance. Alex Rodriguez recently passed Foxx as the youngest player to hit 500 homers. Unfortunately, "Double-X" tailed off considerably after that milestone, finishing his career with 3 part-time seasons and only another 34 long balls. "What if he played today"discussions often mention Jimmie, since elite sluggers fade more gracefully with modern conditioning (and whatever else they've got going on).